VARENNES, Quebec — Retail network sales rose in the fiscal 2018 third quarter at the Jean Coutu Group, which posted declined corporate sales and earnings. On Thursday, the company also reaffirmed the closing timetable for its acquisition by Canadian food and drug retailer Metro Inc. The $4.5 billion (Canadian) Jean Coutu-Metro merger transaction, announced in early October and approved overwhelmingly by Jean Coutu Group shareholders in late November, is expected to be completed in the first half of 2018. For the third quarter ended Dec. 2, Jean Coutu’s franchised store network sales totaled $1.13 billion, up 3.5% from $1.09 billion a year earlier. Revenue edged up 2.5% in the front end and 4% in the pharmacy. Sales of nonprescription drugs, which accounted for 9% of overall retail sales, increased 3.9% versus 2.8% in the prior-year period. Same-store sales grew 3.4% year over year, reflecting gains of 2.3% in the front end and 4% in the pharmacy. Prescription count rose 2.9% overall and on a comparable-store basis. Jean Coutu noted that generic drugs represented 72% of prescriptions filled during the third quarter, up 71.4% a year ago. The company reported negative impacts of 0.1% to pharmacy retail sales from introductions of new generics and 0.5% on retail sales from generic price reductions. In addition, the elimination of periodical withdrawals by the Ministry of Health and Social Services (MHSS) in April lifted the pharmacy retail sales by 1.2%. The retail network opened three stores, including two relocations, renovated two stores and closed one store in the quarter. 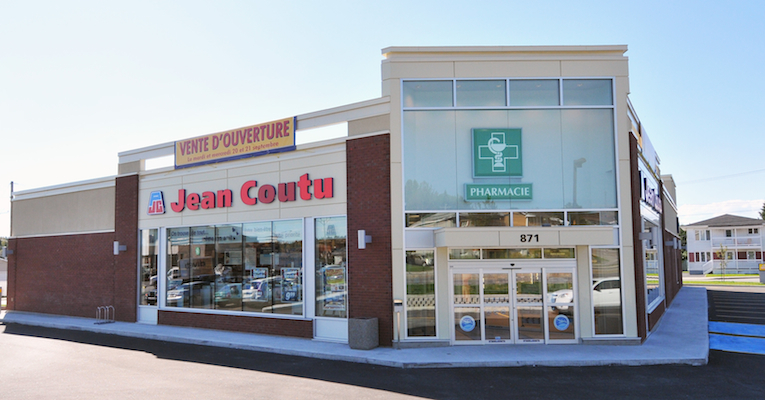 As of the period’s end, Jean Coutu operated a network of 419 franchised stores under the banners PJC Jean Coutu, PJC Santé and PJC Santé Beauté in Quebec, New Brunswick and Ontario. On the corporate side, sales dipped 0.6% in the third quarter to $758.9 million from $763.7 million in the year-ago period. Jean Coutu attributed the decrease primarily to lower revenue from its Pro Doc generic drug business and to the timing of shipments of front-end products in the network. Operating income before amortization (OIBA) came in at $66.4 million for the quarter, down 16.9% from $79.9 million a year earlier. Jean Coutu said the decline stems mainly from a lower contribution by Pro Doc and $8.5 million in expenses related to merger with Metro. OIBA as a percentage of revenue was 8.7%, compared with 10.5% in the prior-year period. Third-quarter net earnings were $42.1 million, or 23 cents per share, down from $51.2 million, or 28 cents per share, a year ago. The decrease reflects the lower Pro Doc contribution to the net income and the $8.5 million in costs associated with the Jean Coutu-Metro merger transaction. Analysts, on average, had forecast Jean Coutu’s third-quarter earnings per share at 28 cents, according to Zacks Investment Research. After the closing of the merger deal with Metro, Jean Coutu is slated operate as a stand-alone division with its own management team, led by François Coutu. Together, Metro and Jean Coutu will form a $16 billion food and drug retailer with 1,308 stores in Quebec, Ontario and News Brunswick.